The Charleston is a dance named for the city of Charleston, South Carolina. The rhythm is a traditional one from West Africa, popularized in mainstream dance music in the United States of America by a 1923 tune called The Charleston by composer/pianist James P. Johnson which originated in the Broadway show Runnin' Wild and became one of the most popular hits of the decade. 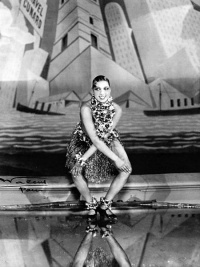 While it developed in African-American communities in the USA, the Charleston became a popular dance craze in the wider international community in the 1920s. Despite its black history, Charleston is most frequently associated with white flappers and the speakeasy. Here, these young women would dance alone or together as a way of mocking the "drys," or citizens who supported the Prohibition amendment, as Charleston was then considered quite immoral and provocative. Charleston was one of the dances from which Lindy Hop developed in the 1930s, though the Breakaway (dance) is popularly considered an intermediary dance form. A slightly different form of Charleston became popular in the 1930s and 40s, and is associated with Lindy Hop. In this later Charleston form, the hot jazz timing of the 1920s Charleston was adapted to suit the swing jazz music of the 30s and 40s. This style of Charleston has many common names, though the most common are 'Lindy Charleston', 'Savoy Charleston', '30s or 40s Charleston' and 'Swing(ing) Charleston'. In both '20s Charleston' and 'Swinging Charleston' the basic step takes 8 counts and was danced either alone or with a partner. Unless indicated otherwise, the text in this article is either based on Wikipedia article "Charleston (dance)" or another language Wikipedia page thereof used under the terms of the GNU Free Documentation License; or on original research by Jahsonic and friends. See Art and Popular Culture's copyright notice. This page was last modified 00:05, 21 January 2012.